On 2-8-02 Rod Collester and Dan Winship decided to take a trip to Muncie Indiana and visit the AMA Museum. The drive from Indianapolis was a reasonable 1.5 hours. We were hoping to see someone flying but the fields were vacant and it was a Friday after all. As we were leaving we were anticipating returning when things were greener and the skies full of airplanes. Since we were in the neighborhood we paid a visit to Muncie Model And Hobbies (I think that is the name of the hobby shop). The hobby shop buts up to the AMA property and is only a few minutes down the road. 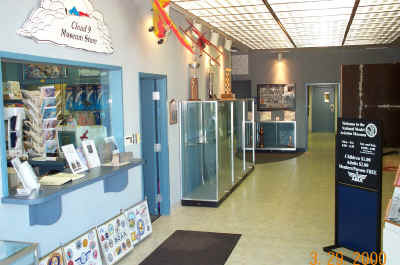 If you are visiting the AMA site pay a visit to the hobby shop. The shop was well stocked with free flight, control line, and R/C planes. They carry many items not found in the big hobby chains such as contest balsa, a full line of Brodak dopes, Polyspan, Silkspan and too many items to mention here. 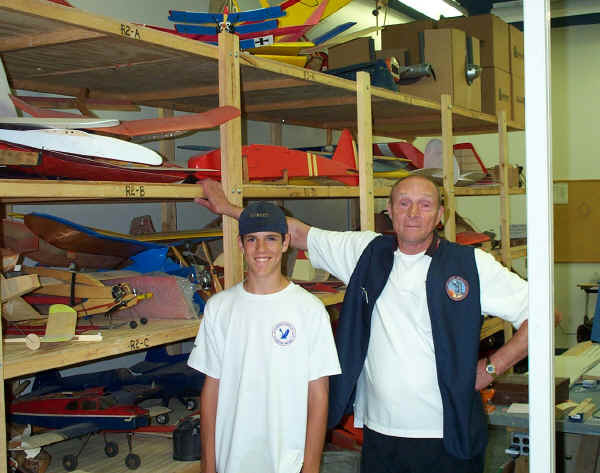 The world's headquarters for model aviation is in Muncie, Indiana! 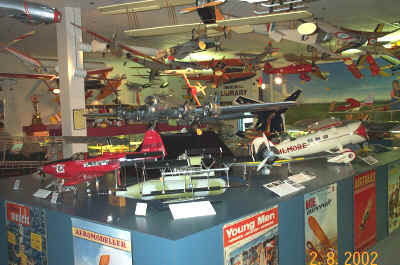 Visit the National Model Aviation Museum and view the largest collection of model aircraft in the United States. Discover how aeromodeling helped change the world of aviation and examine the astonishing craftsmanship and artistry of its masters. The museum store offers educational items for all ages. During the summer months, visit the 1,000 acre flying site and see Academy members fly their aircraft in competitions, especially on weekends and during the National Championships in July and August. Museum hours: Monday through Friday 8:00 a.m. to 4:30 p.m.
Saturday and Sunday 10:00 a.m. to 4 p.m. Flying site admission is free. The lobby to the AMA Museum in Muncie Indiana. Very professionally done. The book/gift store is to the left as you enter the lobby and is well stocked with modeling books and AMA clothing and collectables. Some of the models on display. Every model is significant in some way. 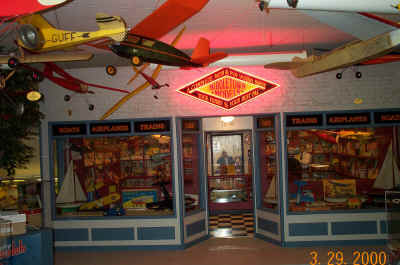 Inside the AMA Museum is a antique hobby shop. Everything in the store is what you would find in a hobby shop in the 1950's. Nothing is for sale but it sure is fun to look at and reminisce. 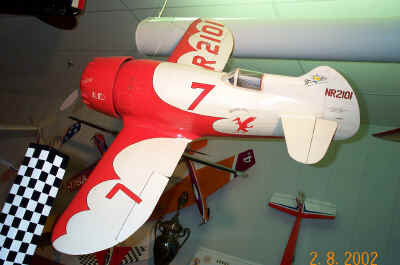 A scale model of a biplane on display. 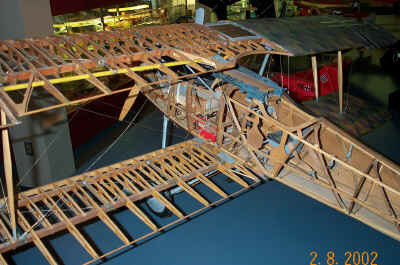 The AMA Museum has many models in varying degrees of construction. A Gee Bee rounding the pylon. Danny and Bob Abernathy taking a tour of the restoration shop in the AMA museum. Bob Abernathy was our informative Museum Guide on our last visit. When visiting the AMA Museum I have found it beneficial to talk to one of the volunteers available to answer questions or point out items that would otherwise be overlooked. If you are looking to add to your magazine or book collection the AMA Museum has many publications from years past for sale. Some of the magazines are sold in yearly bundles. Hard back books are selling for $3.00 each. 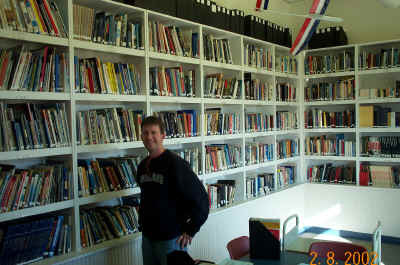 Rod Collester checking out the vast collection of aviation related text in one out of two rooms. The library is a historical buffs dream and all of the old magazines are in binders and listed chronologically. There is also a collection of video tapes covering a variety of model aircraft topics and a TV VCR to watch them. The AMA Museum Library is a place where I could spend weeks.